A man of great vision who had enormous influence on the golden years of pro wrestling, principally in the 1950s and late 60s. Paul's innovative ideas as a promoter, and his personal in ring portrayal as Dr Death are legendary amongst grapple fans from that era. Paul Lincoln arrived in the UK as a young pro wrestler from his home of Sydney, Australia in the mids 50s. He had wrestled in booths in Australia, which included taking on any young sheep shearers who fancied their chances, and en route to the UK had wrestled in Singapore. It was some years later that he donned the famous mask as Dr Death. Paul's entrepreneurial abilities were also evident at the beginning of the British rock scene. In partnership with Australian wrestler Ray Hunter the 2 I's coffee bar was purchased and Paul began to promote rock music in the cellar. In was from this now famous, small venue that Tommy Steele, Cliff Richard, Lionel Bart and many many others were discovered. ( See the full length article in that section ) Paul himself became the manager of Terry Dene and Wee Willy Harris. He also became a promoter of concerts and organised the first ever rock across the Channel. Along with Ray he became a part of a restaurant business and later in the 1960s they were joined by Bob Anthony and fellow Hall of Fame entrant Al Hayes in the legendary Cromwellian Club which was very much the 'in' club of the swinging London era. Although Paul easily could have carved out a successful career in music or the club/restaurant world, his first love had always been pro wrestling. His promotions under the banner of Paul Lincoln Managements were recognised as classics and drew the talents of the greatest stars of the british wrestling scene. 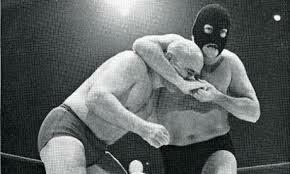 In the heavyweight division there was Ray Hunter, Al Hayes, Mike Marino, Wayne Bridges, Dave Larson, Bob Kirkwood, Dennis Dean plus in general opinion the greatest masked wrestler of them all, Dr Death. Paul Lincoln Management also drew some of the cream of the lightweight talent in the form of Harry Fields, Tony Charles, Eddie Capell, John and Peter Cortez and Bob & Chris Anthony. Many of the top foreign wrestlers of the time were also attracted to the already stellar Paul Lincoln lineup, From USA came Ricky Starr and Sky High Lee, from Spain came Quasimodo and Modesto Aledo, from France came Isha Israel and Jean Corne and from Japan came Togo Tan & Chati Yakouchi. Many of the Paul Lincoln promotions were housed in the opulent surroundings of the Granada Theatres, including Granadas showpiece theatre in Tooting. It was here that Dr Death had his momentous match with the White Angel (Judo Al Hayes). The final exposure required to change the face of British wrestling was TV. The existing World of Sport presentations were contracted to the well established Joint Promotions. Paul Lincoln Managements almost secured the new mid week slot but instead it went to Joint Promotions. The different style of Paul Lincoln's matchmaking would have contrasted favourably for wrestling and helped to maintain interest in the public. Paul loved the challenge of virgin territory and ventured with wrestling promotion in places it had never previously travelled. Amongst these were Malta where Randy Turpin was matched, boxing against the Maltese Middleweight Champion plus a full wrestling bill. Africa was also tackled plus Hong Kong in 1966 where the opening date in the Happy Valley Stadium was delaying with the onset of the famous Kowloon riots, with the wrestlers confined to their hotel under curfew. However, once underway the month long tournament attracted the attention of an influential promoter from Thailand and the promotion was extended into the Thai Boxing Stadium in Bangkok. Another intrepid promotion that Paul undertook was Italy. There, the plan was to operate throughout the north of Italy in a circus marquee which would travel to various towns. Unfortunately, the local organiser had not secured the necessary permits and consequently the police shut down the promotion after the first night. Paul was not to be put off by this and frequent trips were made to the authorities in Milan with help from a top ranking policeman who on his police business trips to London always visited Paul's Italian restaurant in Soho. Eventually the promotion continue, with the wrestlers fit from their short holiday in a hillside hotel in the Italian lakes where the owner (another friend of Pauls) had a very good supply of weight training equipment. Wrestling was entirely new to these places except viewed on tv. The live shows drew a great reaction. Paul Lincoln was an innovative and constructive promoter plus his tremendous wrestling ability in the guise of Dr Death as well as his ability to draw crowds truly deserves his place in the British Wrestlers Hall of Fame. In recent years Paul suffered from degenerative Parkinsons disease and passed away on the 11th January 2011 aged 78 years. There is a comprehensive study of Paul's life and successes on our articles page.